All right ladies and gentlemen its time to get your feet ready for warmer weather. So it is a perfect time to slough off those rough patches of skin off your feet. 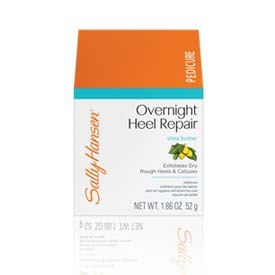 Sally Hansen’s intensive heel repair is the product you need to prepare your feet for sandals. This heel repair product exfoliates rough feet, dry heels and calluses. It has shea butter and tea tree oil which will make for your feet softer and pedicure ready. Just slather the cream all over your feet before bed time. Remember to pay special attention to your heels and calluses since they are the driest part of your feet. Do not forget to apply it to the cuticles on your toes. This area to very thin and can easily become dry. When you wake up in the morning your feet will feel refreshed and smooth. Repeat by applying it nightly until your calluses disappear. Then you should use the cream every two weeks for maintenance to keep your feet looking great. An added bonus to using the intensive heel repair cream, you will be able to ditch wearing socks at night to help the product absorb into your feet. This is a highly concentrated cream so there is no need to do extra work by wrapping your feet. Just a tip for first time user, your feet will not transform overnight. You will need to use this product consistently and then follow-up with maintenance treatments every two weeks. So keep the container visible on your nightstand as a reminder to use it regularly. So get those footsies out there and in those sandals! This entry was posted in Nail Care Services. Bookmark the permalink.